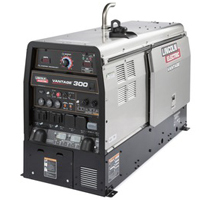 Compact, Multi-Process Engine Driven Welder – The quiet, compact Vantage® 300 is an ideal choice for construction teams, pipe rig owners and rental fleet managers. Compact Case With Stainless Steel Enclosure: Small size and light weight is suitable for many pickup trucks. Standard stainless steel roof, side panels and engine-access door deliver added protection and durability. Lockable, removable sliding engine access door provides ample space for engine and oil filter work without Requiring a large clearance space on your truck. 55% more access than competitive product. Battery drawer on front of machine and top-mounted radiator cover provide convenient access to these systems. Patented tilt down control panel for easy servicing of internal components. 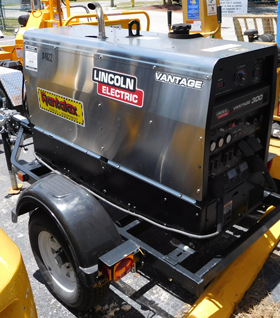 Generator Output: 3-PH: 12.5 kW peak, 11.0 kW cont. 1-PH: 11.5 kW peak, 10.0 kW cont.